Goya (y Lucientes), Francisco (José) de (b. March 30, 1746, Fuendetodos, Spain--d. April 16, 1828, Bordeaux, Fr. ), consummately Spanish artist whose multifarious paintings, drawings, and engravings reflected contemporary historical upheavals and influenced important 19th- and 20th-century painters. Like Velázquez, Goya was a Spanish court painter whose best work was done apart from his official duties. He is known for his scenes of violence, especially those prompted by the French invasion of Spain. The series of etchings Los desastres de la guerra ("The Disasters of War", 1810-14) records the horrors of the Napoleonic invasion. His masterpieces in painting include The Naked Maja and The Clothed Maja (c. 1800-05). He also painted charming portraits such as Senora Sabasa Garcia . For the bold technique of his paintings, the haunting satire of his etchings, and his belief that the artist's vision is more important than tradition, Goya is often called "the first of the moderns." His uncompromising portrayal of his times marks the beginning of 19th-century realism. 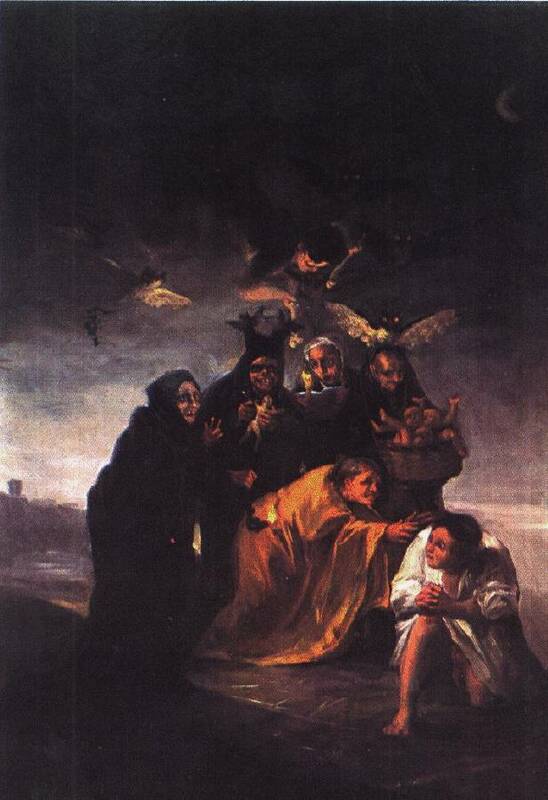 Francisco Jose de Goya y Lucientes was born on March 30, 1746, in Fuendetodos, a village in northern Spain. 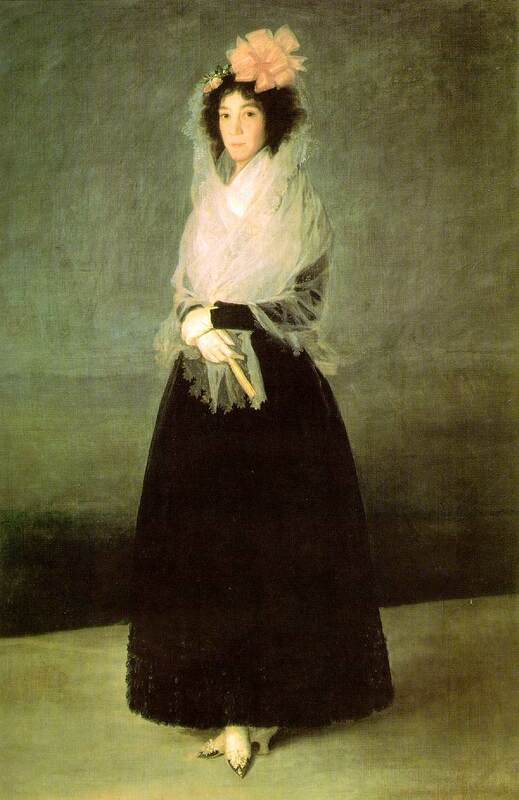 The family later moved to Saragossa, where Goya's father worked as a gilder. 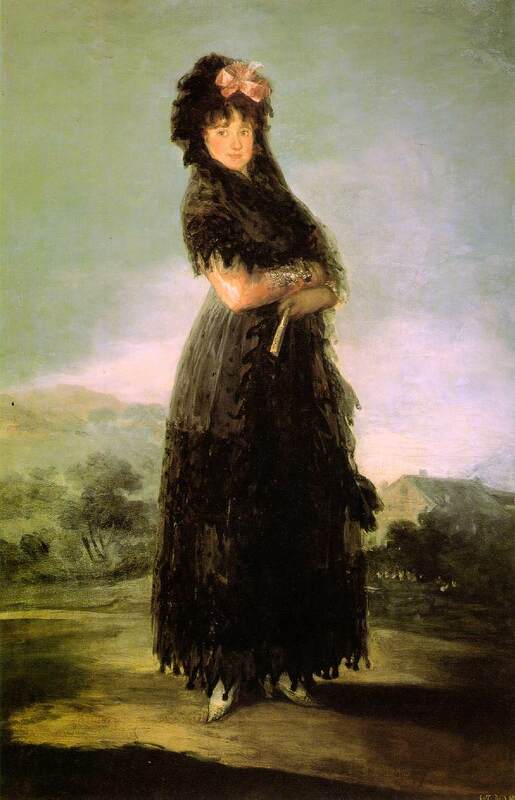 At about 14 young Goya was apprenticed to Jose Luzan, a local painter. Later he went to Italy to continue his study of art. On returning to Saragossa in 1771, he painted frescoes for the local cathedral. 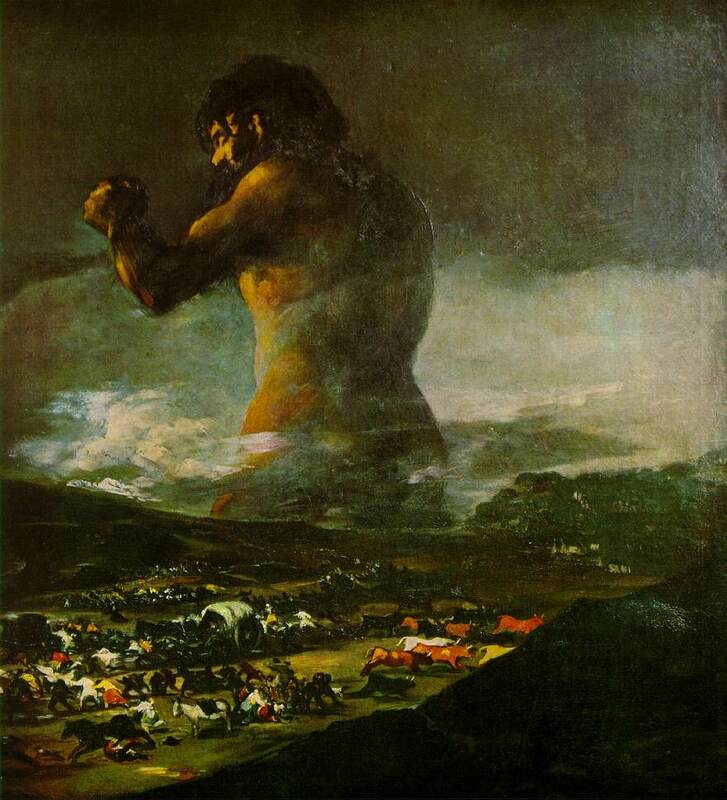 These works, done in the decorative rococo tradition, established Goya's artistic reputation. In 1773 he married Josefa Bayeu, sister of Saragossa artist Francisco Bayeu. The couple had many children, but only one--a son, Xavier--survived to adulthood. The experience helped him become a keen observer of human behavior. He was also influenced by neoclassicism, which was gaining favor over the rococo style. Finally, his study of the works of Velázquez in the royal collection resulted in a looser, more spontaneous painting technique. 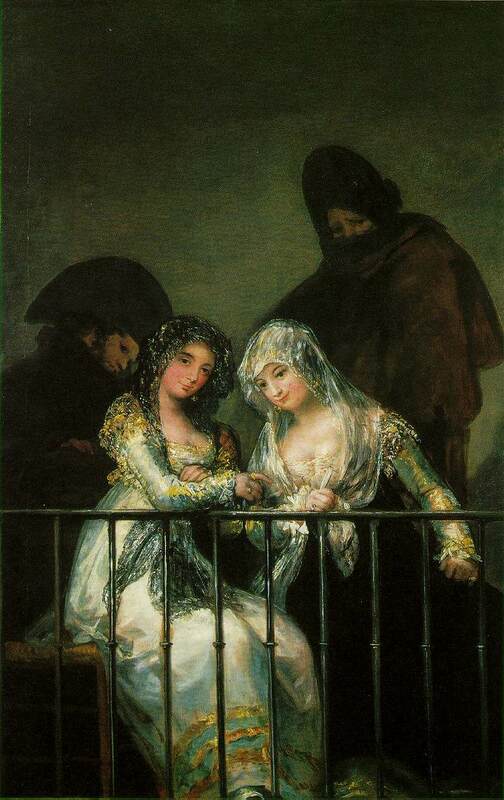 A serious illness in 1792 left Goya permanently deaf. Isolated from others by his deafness, he became increasingly occupied with the fantasies and inventions of his imagination and with critical and satirical observations of mankind. He evolved a bold, free new style close to caricature. In 1799 he published the Caprichos , a series of etchings satirizing human folly and weakness. 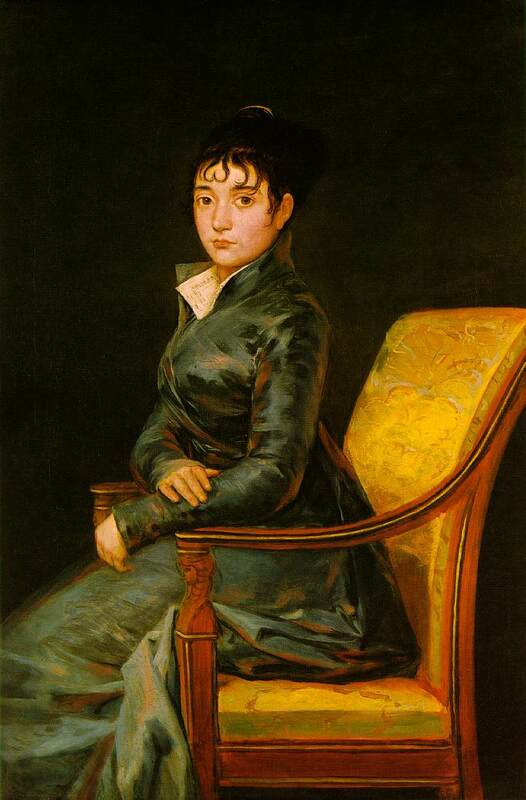 His portraits became penetrating characterizations, revealing their subjects as Goya saw them. In his religious frescoes he employed a broad, free style and an earthy realism unprecedented in religious art. Goya served as director of painting at the Royal Academy from 1795 to 1797 and was appointed first Spanish court painter in 1799. During the Napoleonic invasion and the Spanish war of independence from 1808 to 1814, Goya served as court painter to the French. He expressed his horror of armed conflict in The Disasters of War , a series of starkly realistic etchings on the atrocities of war. They were not published until 1863, long after Goya's death. Upon the restoration of the Spanish monarchy, Goya was pardoned for serving the French, but his work was not favored by the new king. He was called before the Inquisition to explain his earlier portrait of The Naked Maja , one of the few nudes in Spanish art at that time. In 1816 he published his etchings on bullfighting, called the Tauromaquia . 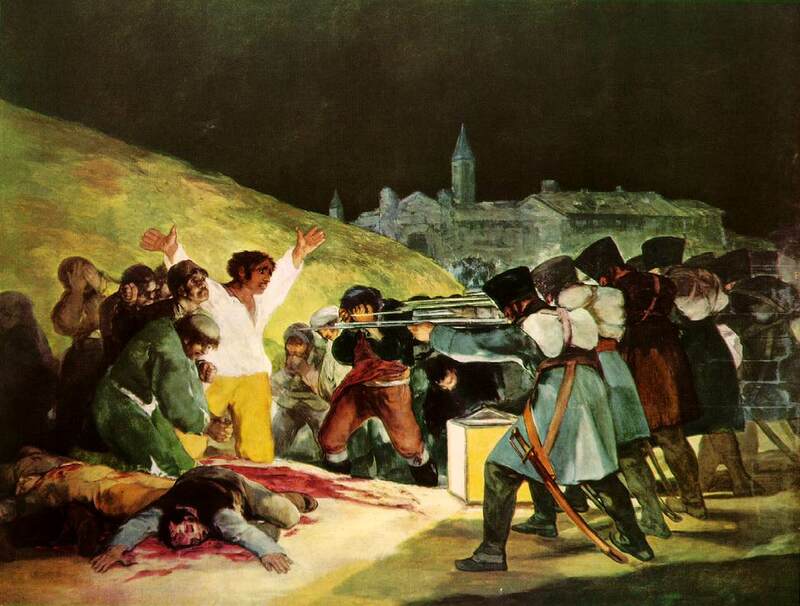 From 1819 to 1824 Goya lived in seclusion in a house outside Madrid. Free from court restrictions, he adopted an increasingly personal style. 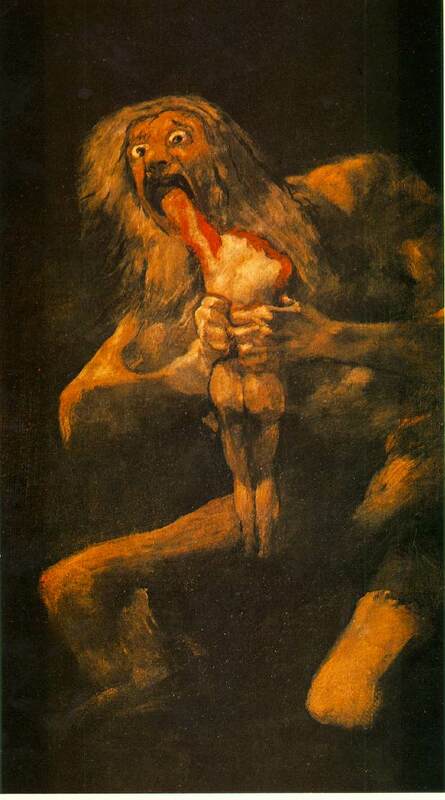 In the Black Paintings , executed on the walls of his house, Goya gave expression to his darkest visions. A similar nightmarish quality haunts the satirical Disparates , a series of etchings also called Proverbios .